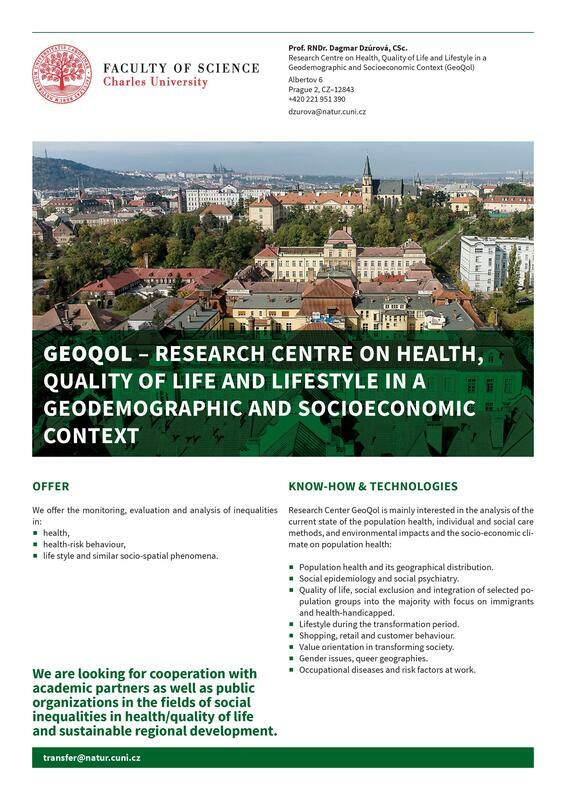 Research Centre on Health, Quality of Life and Lifestyle in a Geodemographic and Socioeconomic Context (GeoQol) is an interdisciplinary oriented working group of scientific researchers, composed primarily of science teachers and students of the Department of Social Geography and Regional Development, Faculty of Science on the Charles University in Prague and the Department of Epidemiology and Public Health, University College London. 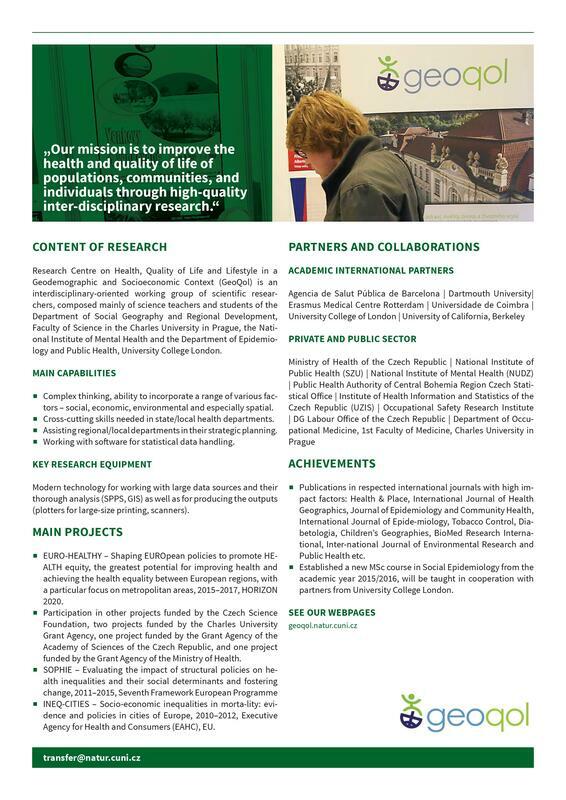 Research center is mainly interested in the analysis of the current state of the population health, individual and social ways of its care, as well as environmental impacts and socio-economic climate on human health. All this in the context of the changing intensity of the effects on health of the aimed population. Dagmar Dzurova is a professor of demography. Her research focuses on analyzing the role of social, environmental, behavioral, and psychosocial factors in health and well-being, and explaining social variations in health, epidemiology of mental disorder and the influence of migration activity in Central and Eastern Europe, i.e. in societies undergoing rapid social change. She is a director of the MSc Social Epidemiology at the Charles University in Prague, Faculty of Science. She is coordinating Czechia part of the EU-HORIZON2020 funded EURO-HEALTHY ("Shaping EUROpean policies to promote HEALTH equity") project. She is a Head of the Research Centre on Population Health, Quality of Life and Lifestyle Among Post-communist Societies in Geo-demographic Perspective (GeoQol) and a member of the GeoMigrace Research Center (GeoMigrace), Faculty of Science, Charles University in Prague. She obtained her PhD in social epidemiology at the Erasmus University Rotterdam in the Netherlands. In her PhD thesis, she focused on educational inequalities in mortality in Europe. After completion of doctoral studies, she moved to France where she conducted research in cancer epidemiology at the International Agency for Research on Cancer. Currently, she works as a researcher at the Department of Social Geography and Regional Development at the Faculty of Science of the Charles University with main research interests in cancer epidemiology and social inequalities in health. information system), spatial aspects of socio-economic differentiation and border studies. She is a member of Economic Geography and Regional Development Center (CEGARR) at the Department of Social Geography and Regional Development. Pavlína teaches the course GIS in Epidemiology. She focuses on the issues of developing countries, sustainable development and global problems and here thesis theme is "mHealth for sustainable developemnt." She focuses on mental health epidemiology. Her thesis theme is "Mental health of young adults." Her work focuses on cancer epidemiology and her thesis theme is "Lifestyle as a risk factor for cancer." His main concern is STDs epidemiology and his thesis is "Epidemiological Study of Sexually Transmitted Infections in the Czech Republic."